Aloe vera: Can you eat? By now you will surely know all the benefits of aloe vera if you use it for the skin. The use in cosmetics helps fight psoriasis, fungal diseases, helps to heal wounds and many conditions more than surely that you have already read in one of our posts. If you have just discovered this miraculous plant, you should know that not only has topical use, but it is also perfect to improve the problems of the internal organism, such as heavy digestion or gastric reflux. The star product of aloe vera is pure juice, with which you can make smoothies and slushies or drink it directly, natural. Have you stopped to think what dishes you can prepare with aloe vera? In addition to telling you about its properties, here you have delicious ideas to surprise with original, delicious and above all very healthy food! – Contains vitamin E, B vitamins, vitamin C and folic acid. – It is very rich in minerals such as magnesium, potassium, sodium, calcium, phosphorus, copper and zinc. It also has a large amount of iron, so it will be a perfect supplement to combat and prevent anemia. – High content of amino acids and antioxidants. – Its high fiber content helps protect the intestine, ideal for people suffering from constipation. Easy recipes with aloe vera. Hands on! 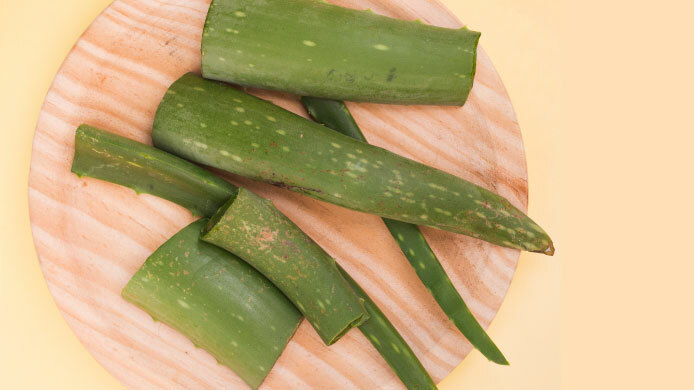 First, make sure you know how to cut the aloe vera leaf. Pay special attention to how to do it, since you will have to remove aloin from the leaf well, a bitter, yellow and very purgative liquid between the gel and the bark of the plant. Remember that you can buy aloe vera tacos in herbalists. With the juice 99,7% pure aloe vera already bottled you can also add it to purees, creams and even soups. Beat the aloe vera with cilantro, tomatoes, squeezed lime, garlic and salt. Add chili or jalapeño if you like spicy and whisk until a thick sauce is left. Use it with nachos. Try adding it to other sauces like guacamole too. You’ll love it! Mix all the ingredients in the blender until you get a liquid texture. If you like it more consistently, throw bread crumbs like traditional gazpacho. Delicious! As you can see, aloe vera is very easy to add to any traditional recipe, providing incredible properties that make this plant a very healthy superfood. Try adding little pieces of aloe vera in salads or add them to rice and vegetable side dishes. There are a thousand combinations!